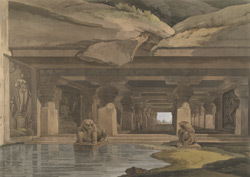 Plate 9 of 'Hindoo Excavations in the Mountain of Ellora near Aurangabad,' engraved by Thomas Daniell after the drawings of his deceased friend James Wales, which Daniell regarded as the sixth set of his 'Oriental Scenery.' This is one of the earliest caves of the Hindu series at Ellora and dates from the Kalachuri period in the early 6th Century, as denoted by the similarity between its columns and those at the Elephanta cave. Two sculptures of lions guard the south entrance and large-scale sculpted wall panels on the sides represent Shaivite myths.